An early start for us today turned out to not be quite early enough. 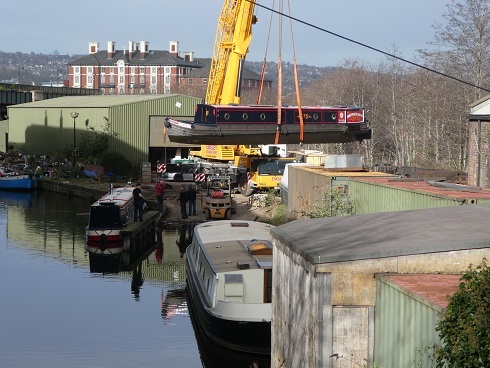 In Sheffield a crane had been brought in to move several boats, one of which was to be NB Oleanna. it turned out that she needed to be moved first and things had started very early. We could see the crane as we approached from a distance. Sadly we missed the strops being adjusted to get Oleanna centred for the lift, the nail biting moments of her being lifted into the air, swung over and then gently lowered into the cut. 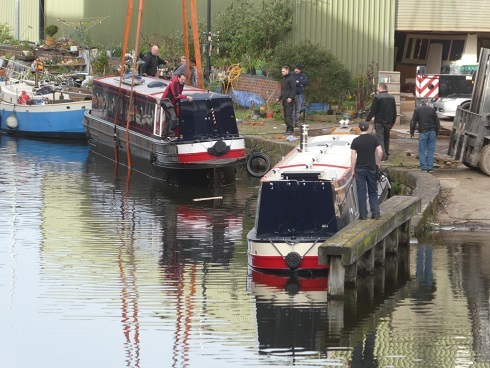 When we arrived we stood on Cadman Bridge where you can over look the yard and not get in the way. There was NB Oleanna sitting with quite a list in the water. She was having steel ballast added to the starboard side to level her up some. Her ballast under the floor had been positioned to compensate for much of the internal fit out being on the starboard side. Just about all our storage is on this side so therefore we will be adding weight when we move on to her. Later on in the day we discussed with Ricky how much weight we would be adding, we had no idea really, but a figure of around 100kgs was thought suitable. The extra ballast added can be adjusted when we’ve moved on, being positioned under the galley units and elsewhere we’ll be shown how to get at it all. 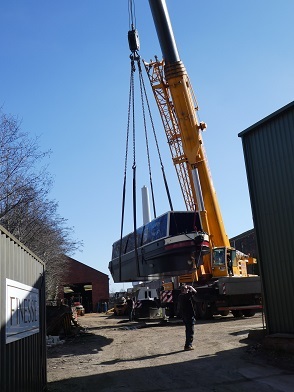 We watched as NB Sheffield Maid was prepared and then craned out and swung right over onto a lorry to be moved to the other end of the yard. 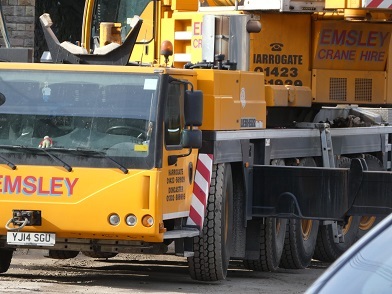 The crane was then retracted and repositioned so that it could lift NB Sheffield Maid off the lorry and be positioned by the paintshop. 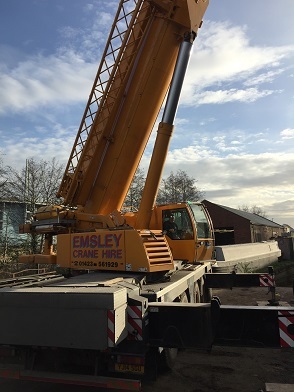 Then a sailaway Sheffield Keel was craned onto another lorry, this was heading to Scotland. 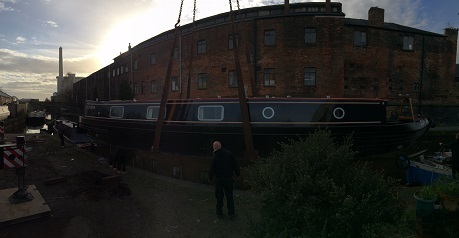 NB Muddy Waters a Finesse boat was then craned out of the cut onto another lorry, this was heading to London. 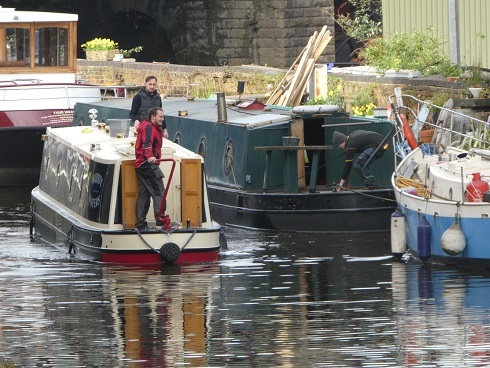 All this took some time with the repositioning of the crane, strapping down of boats. We did our best to keep out of the way. When we got chance between crane moves, we walked down into the yard. With NB Oleanna now on the water getting on was going to be difficult for me as I am currently on crutches. With the help of a fork lift and a pallet I was assisted over the gap where I could then shuffle on board. 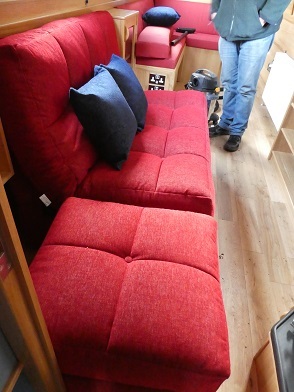 Ricky wanted to show us the jobs that had been ticked off the list from our visit last week and we also wanted to look at the sofa bed that had arrived on Monday. 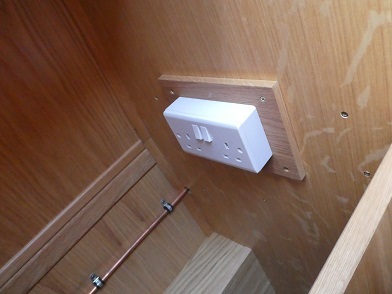 A double electric socket has been added into the rear port cupboard in the galley, this is so that we can have our hand held vacuum hidden away charging. 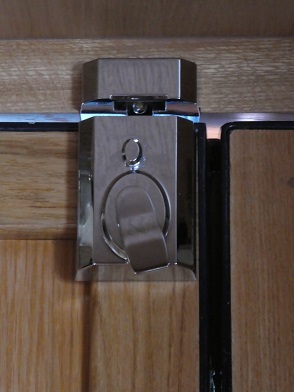 A yale lock has been added to the sliding hatch. 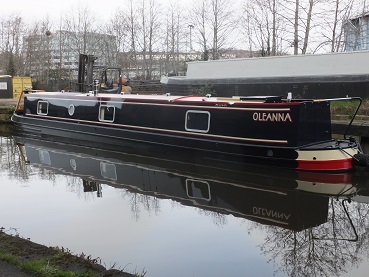 As Oleanna is a reverse layout boat we really wanted some means of being able to lock the back doors from outside instead of only being able to do it from inside. 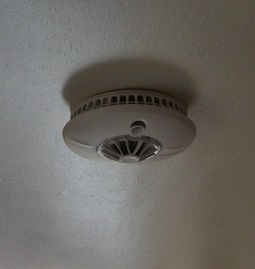 A couple of detectors have been put up on the ceiling. We are not sure if these are just smoke or Carbon Monoxide as well. A slot in the back of the freezer drawer has been cut and the table legs now fit in there nicely. Walking around on her in the water was very strange. 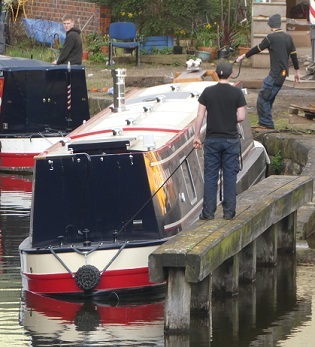 She will be left to settle in the water for a few days and then all the cupboards and drawers will be checked to see if they are still square and that they open and close properly. One thing that was obvious was that the freezer drawer would need a catch so that it doesn’t slide open. 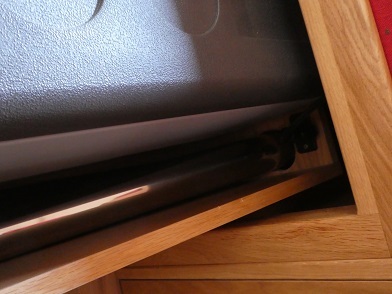 This will be done with magnetic catches so that the drawer can still sit flush. 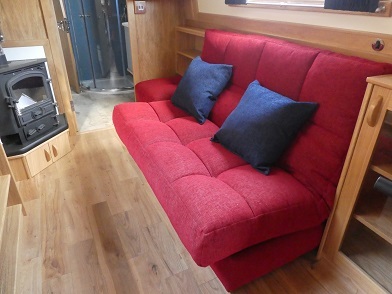 The sofa bed had arrived on Monday afternoon from Sofabed Barn. Michael had adapted their Hampton sofa and pouffe for us. Made to fit into the space we had the sofa is just a little bit shorter than their 1400 one. 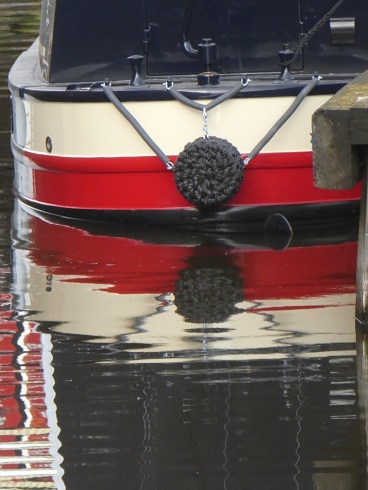 The pouffe is normally the same length as the sofa and when made up into a bed the sofa lays flat and the pouffe extends it to the full width of your boat. But we don’t have the luxury of all that space, the TV would be in the way and so would the pouffe. So he has made us a squarer one which pushes in under some shelving to keep the doorway clear. Then if you want to use it as a seat or foot rest it pulls out. If left at the end of the sofa it makes it long enough to be a single bed. The pouffe has a hinged lid so can be used for storage and the seat of the sofa can be lifted to reveal more storage below. Once things had calmed down a bit with the moving of boats we sat down with Ricky to discuss the battery situation. He was now in touch with the main man at the UK distributors. Several phone calls were had whilst we were there, but still no solution was offered from them. 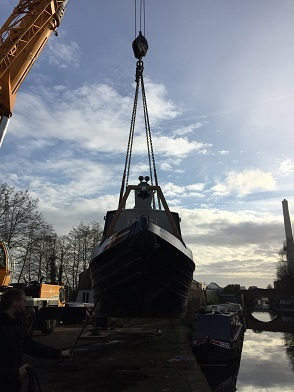 Now that she is in the water the final few jobs can be done and then we can take her out for a test, likely to be in about ten days time. Once this has been done and she is signed off we can arrange to get her to Crick for her launch where we are currently waiting on NB Lillyanne. Ricky has at last heard back from the battery distributor today. They are saying that a battery is being manufactured for us in the States and will be air freighted over due to arrive in two weeks. We have all heard something similar to this several times before from them. So they are being given a deadline of when it has to have arrived by. If it does not arrive the original battery we’ve had since October will be returned and the battery trays will be removed, made bigger and AGM batteries will be installed instead. This entry was posted in Uncategorized on 16th Mar 2017 by pipandmick. Fingers xed on the battery. Looking splendid in the photos. Such an exciting day – \”the lift\”… well I say exciting… I was terrified beyond consolation lol. AFTERWARDS of course you think to yourself 'I don't know whey I was so worried as obviously everyone ELSE knew what they were doing!She's looking lovely though – you must be very excited. Enjoy! Cheers Ade, we've got more than our fingers crossed! Thanks Quaysider. We are very excited. Hoping the next few weeks go well, looking good!